White Plate Racing Association is excited to announce the pre-registration of Mr. Jared Mees, the number one seated professional racer in America at this year's "Pappy Hoel Classic" half mile race. 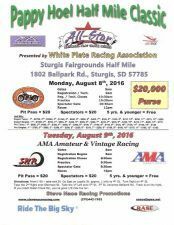 This famous event kicks off The Sturgis Rally with big time Professional racing on Monday, August 8th at the Meade County Fairgrounds. Where #1 goes ,so too does many of the top racers in the nation. Tuesday, August 9th is a spectacular Vintage racing program with top local and National racers. The Tuesday Vintage program is rounded out with The 20th Century Racing board trackers from the 1920's and 1930's. A special class has been added for Roland Sands and The Hooligans on the Tuesday program. All and all this year's race shaped up to be the biggest and fastest in Sturgis history. Gates open at 10 AM both Monday, August 8th (Professional Race) and Tuesday, August 9th (Vintage Race) with general admission of $20. For more information or specifics contact race coordinator Coe D. Meyer at Gypsie Vintage Cycle 605-490-3632.